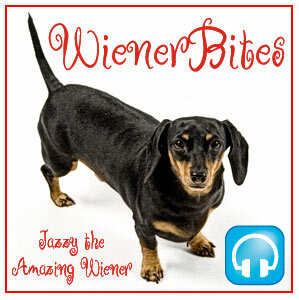 Hey, all ewe wiener lovers…dis is Jazzy the Amazing Wiener! An wud ewe belief dat I finally got Mom to get off her patootie an do me anoder podcast?! Yep, I did! She promised me she wud start helpin’ me doo dem, so now ewe will get to hear me more often! Woo-hoo! Dis is one happy wittle wiener! Oh, an before ewe start sayin’ stuff like I shudn’t be dooin’ dat…I jest want to remind ewe dat I’m 8 whole yeers old, so technically I’m old enuff to do whut I want! Isn’t dat about da funniest ting ewe’ve ever herd? I meen, Big Head has seriously gotta get a wittle smaller hed ‘cuz she wreaks disaster everywhere! Well, all my wiener luvin’ peeps, it’s time for me to go have my evening snak. I’m hopin’ for ice cream, but knowin’ Mom, I’ll prolly jest get a piece of cheese or sumthin’! Stay cool and tune in later for anoder episode! Luv, Jazzy the Amazing Wiener! Hey, all ewe wiener lovers! Ur not gonna belief whut happened tonight! My pet, Lily, had puppies!!!! I’m offishully an Ant!!! Here’s my podcast to tell ewe all about it an I haf pikchurs below of da new puppies, too! See, about a month ago, Mom got a phone call frum da Spy. I nos I shud call da Spy by her name, Angela, but she tells on me when I haf parties an stuff, so I calls her da Spy. Anyways, da Spy called an sed to Mom, “Ewe gots to come down to my wurk. Der’s a little lost dog dat’s been out here in da parking lot an it’s gonna get runned over.” Well, da Spy might haf talked a little bedder dan I type, but ewe nos whut I meen. Anyways, Mom went an got da wittle dog. It was a Boston Terrier and da minute I saw her, I sed to Mom, “Kan we keep her? !” Mom sed no. But obviously dat’s changed ’cause now Lily lives wid us and she’s my pet and she had puppies! See, we didn’t nos dat Lily was pregnant when we rescued her! We twied to find her an owner, but no one wanted her. So Mom an da Spy kept her an she fit in nicely ’cause she kleened my ears an pestered Katie all da time. Dat makes her all wight in my book! Anyways, I noticed she was getting a wittle fat one day an I even sed to her, “Hey, Lily, ur kinda turning into a wittle porker. Maybe knock off da tweats, okay?” But none of us thought she was gonna haf babies! But she did, she did, she did! Dis meens dat I am now offishully Jazzy the Amazing Wiener who’s an Ant!!! An da Spy took one of da first baby. It was a wittle girl. Da next one was a wittle boy! It’s so wittle! I don’t tink I was quite dat little! Mom an da Spy haf Lily all settled down, so da babies cud nurse, which dey are doing. An dey squeak! When dey squeak, Katie shakes an twies to climb into Mom’s lap! It kwacks me up!!! I laffed at her for being such a big scaredy Doberman! Anyways, dat’s whut happened tonight. An I haf to say, da Spy is all wight in my book. See, da Doktor tol her dat Lily wud haf died ’cause she cudn’t haf da puppies normal ’cause dey was too big. So dey had to do a see-section, whutever dat is. An because da Spy saved Lily in da parking lot, she also saved da puppies, too. So, I wants to say dat I weally do tink ur okay, Ange, even if ewe are a Spy! Ur an official “Wiener,” an only special tweeps get to be Wieners! Also, Mom sed dat der were a lots of peeps dat helped tonight, ‘specially her students dat put up wid her being kinda crazy during class. I wanna tell Bill an Camden dat dey are A-OK in my book an I am gonna make dem offishul “Wieners” for being der for Lily. Mom sed we shud name da puppies Billy an Camden ’cause dey helped out! An to Gary K. for drivin’ over to make sure da Spy didn’t pass out, even tho dey had alweady left. Tanks, G-man, for twyin’ to help, too! Ur a Wiener in my book, too! Whew! Whut a night! Dat’s a lot for a little wiener like me to take in, so I tink I’ll call it a night! Hopes all ewe haf a gweat day an I’ll catch ya on da flip side!